I prefer to paint plein air whenever possible to attain the best color fidelity and truest light sources. However, in the Northeast where winter can be five to six months long, much work is generated from my studio. All art created indoors starts on a 60” drawing board as pencil drawings. 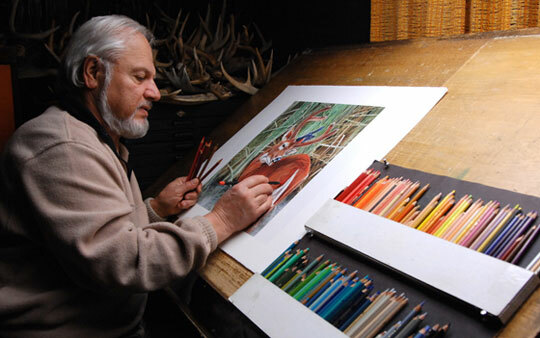 Colored pencils are used to determine texture, balance, composition, design and light source. Rough layouts created in this manner are used to determine choices of medium, palette, watercolor or charcoal paper, canvas or hardboard. I have designed two trays that house colored pencils stacked one over the other pinned to my drawing table. The top stack of over 70 pencils is composed of all warm colors arranged in rainbow fashion from red through the oranges, yellows, etc. The bottom tray of 70 plus colors is made up of all cool colors ranging from green, through the blues, violets, etc. Colors arranged in this manner facilitate speed and focus. Each artwork starts out as an abstract with color working against color, form working against form. For instance, my painting “Keep Looking for a Bluebird” started out in pencils, but because of the two dominant blues, elliptical shapes of both colors were cut out of paper. Teal blue was used to simulate female bluebirds and peacock blue was used for the males. Shifting the two colors to create a spiral design flow was intentional and served as a device to keep the viewer “inside” the painting.